Opium farmers in India are complaining that addicted parrots are destroying their crops. The farmers in Madhya Pradesh state say that along with a season of uneven rainfall, the parrots are having a serious impact on their yields. They say that attempts to scare the birds away with loudspeakers have made little difference and local authorities have not helped. 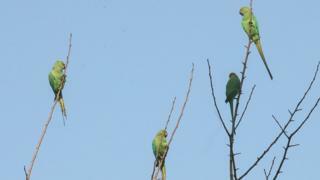 The parrots could cause them to suffer huge losses, the farmers warn. Asian News International (ANI) tweeted a video of birds flying away with an entire poppy flower. The farmers supply the drug to medicinal companies and have a licence to grow the plant. One grower, Nandkishore, told NDTV he had tried making loud sounds and even used firecrackers to scare off the birds. He explained that one poppy flower produces 20-25 grams of opium, but "a large group of parrots feeds on these plants around 30-40 times a day and some even fly away with poppy pods". "Nobody is listening to our problems. Who will compensate for our losses?" he said. Dr RS Chundawat, an opium specialist at a Horticulture College in Mandsaur, told The Daily Mail that opium gives the birds instant energy - similar to the effect of tea or coffee for a human. He said that once the birds had experienced this feeling, they would quickly fall prey to the addiction.